Stockton police Capt. J.T. 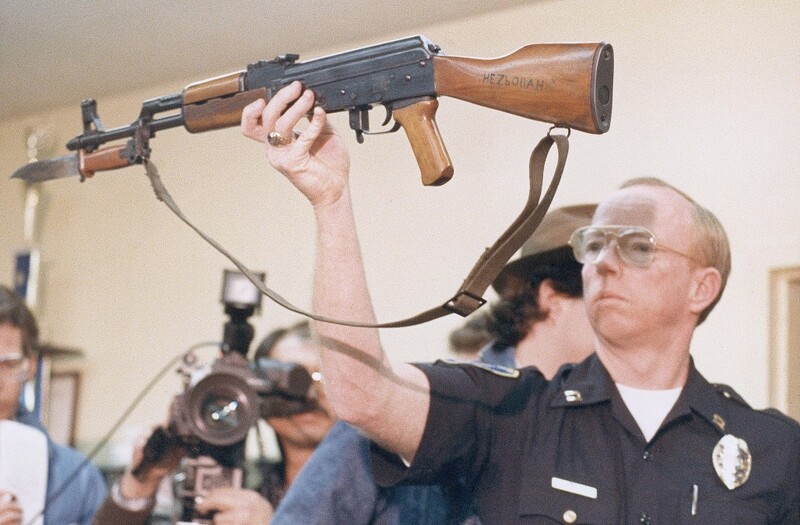 Marnoch holds up an AK-47 assault rifle that a man used to kill five children and injure 30 others at a Stockton, Calif., elementary school in 1989. These aren’t your grandfather’s hunting rifles. Uzi’s, AK-47s, AR-15s, Bushmaster semi-automatic rifles – all are banned by California’s Assault Weapons Control Act. Yet thousands of the guns legally remain in the state. Anyone who registered an assault weapon with the California Department of Justice’s Bureau of Firearms before Jan. 23, 2001, effectively was grandfathered in. All told, that’s 145,253 guns that would be illegal if purchased today. Owners of these grandfathered guns need to keep a signed letter from the state proving they are the legal owner. They aren’t allowed to sell it or give it away; it’s a felony to transfer ownership of a registered assault weapon. Rick Travis, field director for the California Rifle and Pistol Association, the state affiliate of the National Rifle Association, declined to comment. In addition to the host of guns grandfathered in and guns specifically made to sidestep provisions of California law, two other major exemptions exist: for law enforcement officers and for applicants who establish good cause for a special permit issued by the Department of Justice. California is one of nine states plus the District of Columbia that regulate assault weapons, according to the website smartgunlaws.org. And it was the first state to ban semi-automatic assault-style rifles. The law followed a 1989 shooting at Cleveland Elementary School in Stockton, where five children were killed and one teacher and 29 students injured by a man armed with a semi-automatic AK-47. Initially banning guns by name, lawmakers later amended the law to cover a list of generic characteristics associated with the weapons. This came after gun manufacturers changed the names of guns and marketed them as new, even though in many cases there were few if any substantive changes from the previous year’s model. Today, the law prohibits three categories of guns. 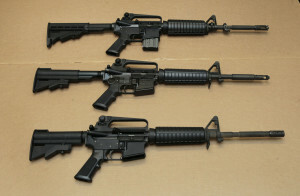 The first bans weapons by name, such as the original Colt AR-15. The second covers the popular AK and AR-15 rifle platforms, which include a host of similar guns made by different manufacturers. And the third includes guns that feature generic characteristics, such as pistol grips and telescoping stocks, which are largely cosmetic. Banned guns are easily made legal, however, by adding features such as a fixed-magazine “bullet button.” A single round of ammunition is used to push a bullet button in order to remove a magazine and reload. Some highly customizable semi-automatic rifles such as the AR-15 also are being assembled by individuals at home and made with unmarked parts that don’t require government registration. Matt Drange can be reached at mdrange@revealnews.org. Follow him on Twitter: @mattdrange.